The first integrated circuits weren’t tiny flecks of silicon mounted to metal carriers and embedded in epoxy or ceramic. The first integrated circuits, albeit a looser definition of such, were just a few transistors, resistors, and diodes mashed together in the same package. With this in mind, [Rupert] created his own custom IC. It’s an IR receiver transmitter constructed out of a transistor, resistor, and an LED. The attentive reader should be asking, “wait, can’t you just buy an IR receiver transmitter?” Yes, yes you can. But that’s not a hack™, and would otherwise be very uninteresting. [Rupert]’s IC is just three parts, a 2n2222 transistor, a 220Ω resistor and an IR LED. With a good bit of deadbug soldering, these three parts were melded into something that resembled, and had the same pinout of, a Vishay TSOP4838 IR receiver. The epoxy used to encapsulate this integrated circuit is a standard 2-part epoxy and laser printer toner. Once everything is mixed up into a gooey slurry, it’s dripped over the IC producing a blob of an integrated circuit. It’s functionally identical to the standard commercial version, and looks good enough for a really cool project [Rupert]’s been working on. Thanks [foehammer] for the tip. [Peter]’s folks’ cable company is terrible – such a surprise for a cable TV provider – and the digital part of their cable subscription will only work with the company’s cable boxes. The cable company only rents the boxes with no option to buy them, and [Peter]’s folks would need five of them for all the TVs in the house, even though they would only ever use two at the same time. Not wanting to waste money, [Peter] used coax splitters can take care of sending the output of one cable box to multiple TVs, but what about the remotes? For that, he developed an IR remote control multidrop extender. With a few small boards, he can run a receiver to any room in the house and send that back to a cable box, giving every TV in the house digital cable while still only renting a single cable box. The receiver module uses the same type of IR module found in the cable box to decode the signals from the remote. With a few MOSFETs, this signal is fed over a three-position screw terminal to the transmitter module stationed right next to the cable box. 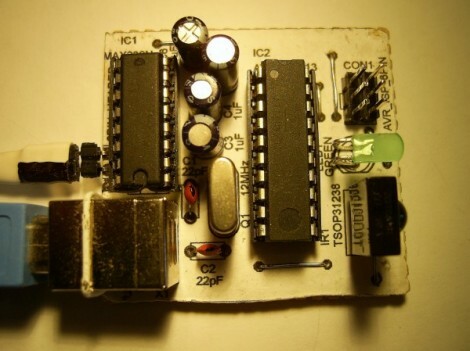 This module uses a PIC12F microcontroller to take the signal input and translate it back into infrared. [Peter]’s system can be set up as a single receiver, and single transmitter, single receiver and multiple transmitter, many receivers to multiple transmitters, or just about any configuration you could imagine. The setup does require running a few wires through the walls of the house, but even that is much easier than whipping out the checkbook every month for the cable company. The problem with building your own electronics for the living room is that the final product may not fit your decorating style. This was true with [Itay’s] prototype of a universal USB IR receiver. So after testing it out for a few weeks he decided to build a final version that started by selecting an enclosure he could be proud of. He came across an LED flash light at the dollar store which has an aluminum body. When we read about this we envisioned a cheap version of a Mag Light from which he removed the cylinder that holds the batteries. But actually, the pod seen above is the entire flashlight (with an added base). It forced him to design a tiny surface mount PCB to fit everything inside. It’s not too much of a stretch since IR receivers tend to be small anyway. [Itay’s] design put a PIC 18F2553 on one side of the board. The other side hosted the through hole components: an IR receiver, LED for feedback, and the connections for the USB cable that exit through the rubber button cover that used to switch the flashlight on. He had a problem with one of the resistor values which took a while to figure out. But eventually he got it working. It’s been in use now for six months.